This prompt is designed with the intent to imagine who your child would be now and to tell a beautiful story about that. I always wonder what Lach would love to do, who his friends would be, how he would interact with his siblings, and what his personality features would be. It is a mystery, but I don’t know if I’d classify those daydreams as a beautiful mystery. They are always laced with the ache of not knowing for sure. However, conjuring up ideas of what our glorious reunion will be like in heaven—that is a beautiful mystery. I’ve read lots of books on heaven and people’s near death experiences. I wanted and needed to know what “home” is like for my boy. It’s amazing how from so many different authors and experiences, the overwhelming peace and joy is a common thread to all of them. As a family, we often imagine what it will be like when we get there. We always get to hug Lachlan. We’ll see the room God and Lachlan have prepared for us. Together we might go for a ride in a kangaroo’s pouch, sit on a lion’s back, hold St. Michael’s sword, tumble in the soft grass without getting hurt, enjoy new and improved bodies, look into Jesus’ eyes and sit in the presence of God. No death. No pain. No crying. No tears. Ever. It’s hard to imagine, but I’m told it’s true. That’s a beautiful mystery. I can’t wait to see it with my own eyes. “God needed another angel” or “God took my child.” Those are phrases that you often hear, and things that I’ve even said myself. As you’re scrapping for bits of comfort you take everything you can find and try it on for size…does this fit? Does this help? It took me some time to be able to recognize that those catchphrases are really incongruent with the God I’ve always learned about. Our God is the God of Love, God of Mercy, the source of all good and only good. Separating a mother from her child and the premature death of a baby do not even whisper a hint of love, mercy, or goodness. Our response to the death, on the other hand, can be full of all of those things. God does not NEED anything. He is whole and complete in and of himself. He didn’t give me the incredible gift of this beautiful child to say, “Just kidding! I need him more than you do!” That’s rude. We chose the reading from John chapter 11 of Jesus raising Lazarus from the dead for Lach’s funeral. I wanted Jesus to raise my baby from the dead. He didn’t. Surely everyone in Bethany who’d lost a loved one for many years following the resurrection of Lazarus wanted Jesus to save them from their grief and raise their loved ones from the dead too. He didn’t. Even though a miraculous resurrection wasn’t part of the deal for me, there are some big things to take home from the story. I’m guessing Jesus is getting used to being blamed for the bad things that happen to people. Lazarus’ sister, Martha, did it too. 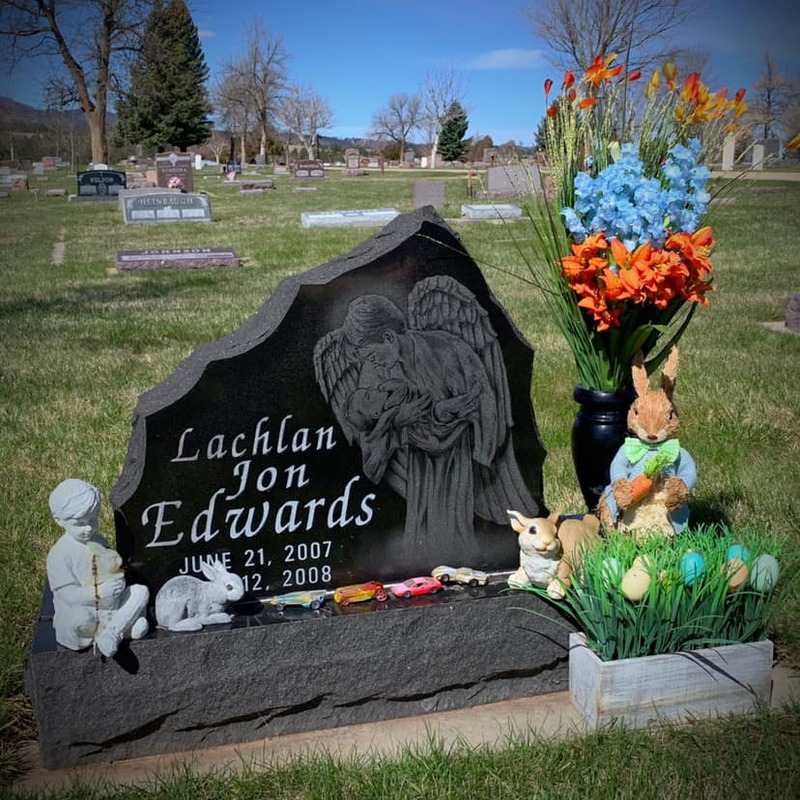 When she met Jesus, her words were “Lord, if you had been here, my brother would not have died.” I know I said the same thing in response to Lach’s death. “Where were you?! If you were here this wouldn’t have happened!” While Martha might not have been saying, “you DID this,” her words were certainly as accusatory as mine were, blaming him for not doing enough to stop it. When Jesus came to Bethany, he already knew his plan to bring Lazarus back. Knowing ahead of time that their tears were about to turn from tears of sorrow to tears of abundant joy didn’t separate him from the grief of the moment. He wasn’t aloof to their suffering with a “Chill out. Hold on. You’re all gonna be fine.” sort of attitude. He met them where they were, AND HE WEPT. This tiny little verse says so much. It shows us God’s reaction to the suffering and death of the human experience. 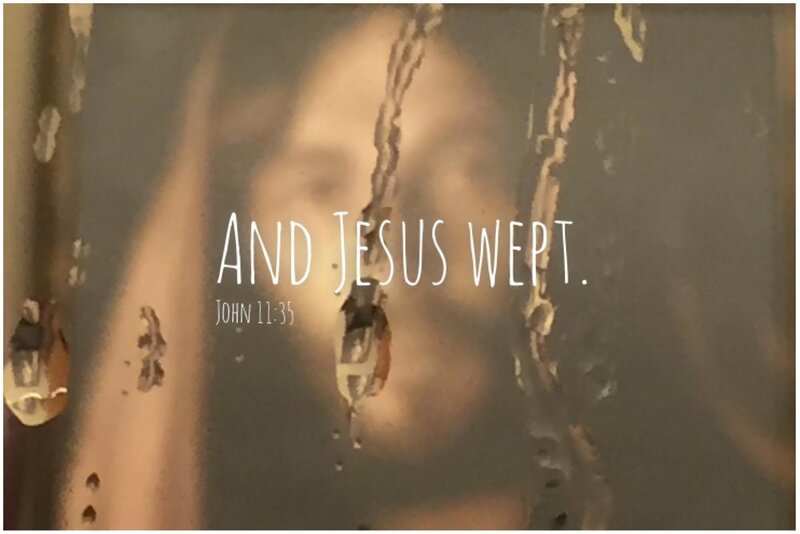 He weeps with us. He hurts with us. He suffers with us. Of course, he knows what he came to do, and he has a plan to take that hurt away, but that doesn’t stop him from being endlessly compassionate to our grief, our suffering, our losses, our hurt. THIS is the God I know—the God of Love, God of Mercy, God of goodness. This fits. Being able to put those pieces together and to see God as my compassionate supporter and my comforter rather than the cause of my strife was a tremendous step for me in finding some peace for my tormented heart and it helped me to restore some trust in the God that I thought had betrayed me. 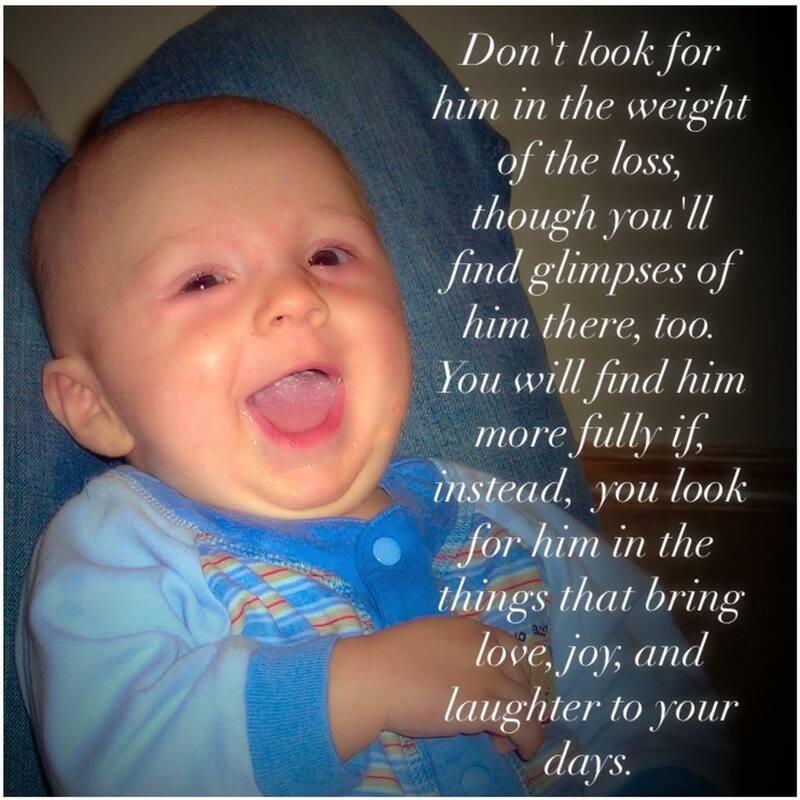 My little boy died---and He wept.